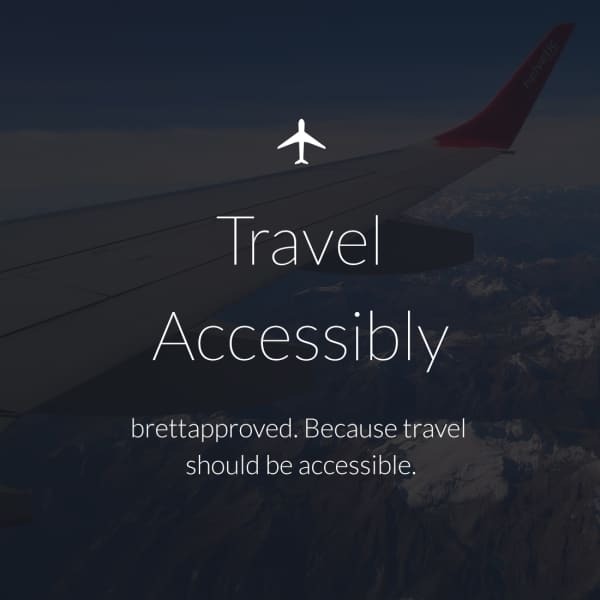 brettapproved exists to provide reliable information, goods, and services, to people with disabilities and mobility challenges who wish to travel outside their residences. Our community members dine, seek entertainment, and travel. Some travel within their neighborhoods; others travel around the world. Most take a few regional trips each year and once in awhile, travel abroad or take a big ‘bucket list’ trip. brettapproved is a participant in the Amazon Services LLC Associates Program, an affiliate advertising program designed to provide a means for us to earn fees by linking to Amazon.com and affiliated sites. We review, display, and link to places where you can purchase goods and services. Only goods and services that pass our rigorous review and testing are displayed; that’s what we mean by “reliable.” Our goal is to help more people to learn about and have access to the goods and services that help make travel, dining out, and entertainment more enjoyable, less stressful, and easier to obtain. We respect your privacy and are committed to protecting it through our compliance with this policy. brettapproved offers various services (the “Services”) to provide businesses and individuals access to a rich collection of resources related to search engine optimization and inbound marketing, including without limitation search engine optimization tools, link analysis tools, downloadable toolbars, application program interfaces (“APIs”), site profile services, search analytics, blogs, user-generated-content, personalized content and industry surveys and opinion polls. The Services include access to the website at www. brettapproved.com and any related website or domain operated by Company (the “Sites”). To our subsidiaries and affiliates and partner providers. If we believe disclosure is necessary or appropriate to protect the rights, property, or safety of brettapproved, our customers or others. This includes exchanging information with other companies and organizations for the purposes of fraud protection and credit risk reduction. Promotional Offers from the Company. If you do not wish to have your contact information used by the Company to promote our own or third parties’ products or services, you can opt-out by checking the relevant box located on the form on which we collect your data or at any other time by logging into the Sites and adjusting your user preferences in your account profile by checking or unchecking the relevant boxes or by sending us an e-mail stating your request to [email protected] If we have sent you a promotional e-mail, you may send us a return e-mail asking to be omitted from future e-mail distributions. This opt out does not apply to information provided to the Company as a result of a product purchase, warranty registration, product service experience or other transactions. You may also send us an e-mail at [email protected] to request access to, correct or delete any personal information that you have provided to us. In some cases, we cannot delete your personal information except by also deleting your user account. We may not accommodate a request to change information if we believe the change would violate any law or legal requirement or cause the information to be incorrect. California Civil Code Section § 1798.83 permits users of our Sites that are California residents to request certain information regarding our disclosure of personal information to third parties for their direct marketing purposes. To make such a request, please send an e-mail to [email protected],com or write us at: 3232 East Hiddenview Drive, Phoenix, AZ 85048.
brettapproved offers information, ratings, reviews, and promotion of goods and services that serve travelers of all physical abilities and capabilities. Collectively, we’ll refer to these resources as the “Services” in this Agreement. brettapproved Services may be offered across a number of web domains. It is currently offered, without limitation and possibility of future expansion, at brettapproved.com. This domain and any future domains are referred to as the “Site” in this Agreement. You may access the Sites or Services with a free account as a user (“User”). While access to certain portions of the Sites and selected features of the Services is free, brettapproved reserves the right to charge fees for features and benefits associated with the Sites or Services at any time. brettapproved may offer APIs for use by third parties. While brettapproved may not charge for a brettapproved API use under certain circumstances, any such use is subject to these TOU. If brettapproved enters a separately negotiated agreement with you related to a brettapproved API use, these terms will still apply, but any conflicting terms in that agreement will override terms in this Section. All data associated with a brettapproved API is proprietary to brettapproved. If you use or publicly display such proprietary data associated with this API, you must comply with any link and attribution guidelines set forth on the Sites from time to time in addition to these TOU. Moreover, you may not resell or redistribute proprietary brettapproved API data via your own API or offer it to third parties. brettapproved reserves the right to suspend or terminate any API or access to any API at any time and for any reason, with or without cause. If your access to an API is suspended or terminated, you have no rights associated with such API and you acknowledge that you will not be entitled to any remuneration or compensation of any kind. You agree to inform brettapproved immediately upon learning of a security breach that relates to your account or a third party’s improper use of the Services in connection with your account. You agree that your rights in a subscription or use of any paid Services may be dependent upon demonstrating that you have paid for said subscription or Services. You acknowledge that if you sign up for any Services and pay via credit card, and brettapproved cannot charge your credit card at renewal, brettapproved may cancel your subscription and you may lose access to the Services and any data associated with your subscription. While some Services may be paid for via invoice by mutual written agreement by you and brettapproved, brettapproved reserves the right to quote additional fees for invoiced accounts. If brettapproved has entered into an invoicing relationship with you, the following terms apply unless superseded by written agreement: you agree to pay all undisputed invoices within 30 days. You agree that brettapproved may charge interest of 1.5% per month for past due invoices, or the highest rate permitted by law, and you agree to be liable for reasonable attorney fees and collection costs arising from brettapproved’s efforts to collect on past due amounts; If you fail to pay an invoice, brettapproved reserves the right to cancel your subscription, access to any Services, and any data associated with your subscription or the Services. brettapproved assumes no obligations to screen and does not routinely pre-screen User Generated Content posted via the Sites or in connection with the Services. brettapproved does not guarantee the accuracy, integrity, appropriateness, quality, or validity of User Generated Content. User Generated Content does not necessarily represent the views or opinions of brettapproved and under no circumstances will brettapproved be liable in any way for any User Generated Content, including without limitation liability related to any loss or damage of any kind incurred as a result of the use of any User Generated Content posted, emailed, or otherwise transmitted via the Sites. As such, you are solely responsible (at your own expense) for creating backup copies and replacing any User Generated Content you post or store on the Sites or otherwise provide to brettapproved. Notwithstanding its lack of obligation, brettapproved may remove any User Generated Content at any time at its sole discretion, including User Generated Content that in the sole judgment of brettapproved violates this TOU or which may be offensive, illegal, or violates the rights of any person or entity, or harms or threatens the safety of any person or entity. brettapproved assumes no obligation to maintain or store your content. brettapproved may delete, modify, or restrict the display of User Generated Content at any time for any reason, including but not limited to a change in Subscriber account level, Services cancellation, violation of the TOU, or violation of the brettapproved Community communication etiquette; once deleted, User Generated Content may not be retrieved. VI. brettapproved’s Permitted Use of User Generated Content and User Data. brettapproved does not claim ownership of User Generated Content. Subject to the rights granted to brettapproved in this TOU, you retain full ownership of all of User Generated Content to the extent you would otherwise have intellectual property rights or other proprietary rights associated with it. When you post User Generated Content to the Sites, you authorize and direct brettapproved to make such copies as brettapproved deems necessary to facilitate the posting and storage of User Generated Content on the Sites and provide the Services to you. You further authorize brettapproved to anonymize and aggregate User Generated Content and any data you share with us (“User Data”), including data associated with your google analytics and social media profiles. You authorize brettapproved to use such content and data, by way of example and not limitation, to enable brettapproved to provide current or future services and for benchmarking, research and development, products, or other marketing purposes. By choosing to post, upload, or transmit data to the Sites (including authorization to access any third-party account or profile), you grant brettapproved, its affiliates, partners, and assigns an irrevocable, perpetual, worldwide, royalty free, non-exclusive license (with the right to sub-license) to use anonymized and aggregated User Generated Content and User Data, in all present and future media, and in any manner relating to the Sites or Services. In addition, with respect to User Generated Content that you elect to post or transmit on the community portions of the Sites (“Interactive Content”), including without limitation your User Profile, the brettapproved Blog, any other future brettapproved sites or services that are designed to be viewed by the public or other Subscribers, you grant to brettapproved, its affiliates and partners an irrevocable, perpetual, worldwide, royalty free, non-exclusive, transferable license (with the right to sublicense) to use, reproduce, translate, alter, publicly perform, publicly display, modify, adapt, publish, excerpt (in whole or in part) and distribute such Interactive Content, in whole or in part, in all present and future media and in any manner relating to the Sites or Services (including, without limitation, in connection with the appearance of such Interactive Content on brettapproved and on the sites of our affiliates, partners and others with whom brettapproved may have business relationships relating to the Sites) and the distribution and promotion of the Sites. You further agree that brettapproved is free to use any ideas, know-how, concepts, techniques or other materials implied by Interactive Content. You may remove Interactive Content from the Sites at any time. If you choose to remove Interactive Content, any license granted above for the content shared by on you on the community portions of the Sites will remain in effect. You acknowledge that brettapproved may retain archived copies of such Interactive Content. brettapproved may establish limits concerning use of the Services at its discretion, including by way of example the frequency with which you may access the Services or your ability to post User Generated Content. brettapproved reserves the right to modify or discontinue the Services (including any part or feature thereof) at any time without notice. You agree that brettapproved shall not be liable to you or to any third party for any modification, suspension or discontinuance of the Services. From time to time, brettapproved may add new features to the Services that may be described as “beta” services or features (collectively, “Beta Features”). Beta Features will be considered part of the Services and all provisions of this Agreement relating to the Services will apply to the Beta Features as well. Users acknowledge that Beta Features may be untested, non-functional, and/or partially functional features of the Services. If you elect to use a Beta Feature, you do so at your own risk. Notwithstanding anything else in this Agreement to the contrary, brettapproved disclaims any and all warranties associated with any Beta Feature. Any risk that Beta Features may harm or interrupt the regular running of your software or hardware is borne entirely by Users. brettapproved owns the visual interfaces, interactive features, graphics, design, compilation, computer code, products, software, and all other elements and components of the Sites (“brettapproved Content”). brettapproved Content specifically excludes User Generated Content. brettapproved owns the copyrights, trademarks, service marks, trade names and other intellectual property and proprietary rights throughout the world associated with brettapproved Content, the Sites, and the Services. Users may not modify, reproduce, distribute, create derivative works or adaptations of, publicly display or in any way exploit any of the brettapproved Content in whole or in part except as expressly authorized in writing by brettapproved. brettapproved does not grant any express or implied rights in brettapproved Content to Users, and all rights in and to the Sites and to brettapproved’s Content are retained and reserved by brettapproved. Moreover, the term brettapproved and anything on the Sites that identifies or distinguishes brettapproved from other goods are services are registered or unregistered trademarks of brettapproved (the ” brettapproved Trademarks”). Except as otherwise permitted by law, you agree not to display or use in any manner the brettapproved Trademarks without brettapproved’s prior written consent. You must provide all of the following in writing: identify the copyrighted work that you claim has been infringed (or if multiple copyrighted works, then a representative list of such works); identify the content on the Services that you claim is infringing with enough detail so that brettapproved may locate it; provide a statement by you that you have a good faith belief that the disputed use is not authorized by the copyright owner, its agent, or the law; provide a statement by you declaring that the notification is accurate, and, under penalty of perjury, that you are the exclusive owner of the copyright interest involved or that you are authorized to act on behalf of the exclusive owner; provide information reasonably sufficient to permit brettapproved to contact you, such as an address, telephone number, and email address; and your physical or electronic signature. Upon receipt of notice as described above, brettapproved will take whatever action, in its sole discretion, it deems appropriate, including removal of the challenged use from the Services or termination of the posting account. brettapproved provides the Services “as-is”. brettapproved provides no express warranties, guarantees, or conditions related to the Sites or Services. To the extent permitted by law, brettapproved disclaims any implied warranties including those of merchantability, fitness for a particular purpose, workmanlike effort, and non-infringement, and including those arising by usage of trade, course of dealing, or course of performance. Without limiting the generality of the foregoing, brettapproved does not warrant that the Sites or Services will be accurate, error-free, virus-free, or uninterrupted or that it will meet any specific requirements of a User or Subscriber. Users may have additional rights as a consumer under local law that this Agreement cannot change. You acknowledge that brettapproved cannot provide Services at a reasonable price without limiting its liability as set forth herein, so, as an express condition of use of the Sites or Services, you agree to limit brettapproved’s potential liability to you as described in this clause. This limitation of liability is a fundamental element of the basis of the bargain between brettapproved and you as a User. brettapproved does not: (i) guarantee the accuracy, completeness, or usefulness of any information on the Sites or Services, or (ii) adopt, endorse or accept responsibility for the accuracy or reliability of any opinion, advice, or statement made by any party that appears on the Sites. Under no circumstances will brettapproved or its affiliates or assigns be responsible for any loss or damage resulting from your reliance on information or other content posted on the Sites or transmitted to or by any Users. To the extent permitted by applicable law, brettapproved shall not be liable for any consequential, special, or incidental damages or lost profits resulting from your access to or use of the Sites or Services, whether based on breach of contract, breach of warranty, tort (including negligence), or any other legal theory. This includes your inability to access or use (including due to modification, suspension, blocking, discontinuance, cancellation, or termination of the Services or any part thereof) the Sites or Services. Without limiting the foregoing, you specifically acknowledge that brettapproved is not liable for the defamatory, offensive, infringing, breaching, fraudulent, or illegal conduct of other Users or third parties and that the risk of injury from the foregoing rests entirely with you. These limitations apply to any matter related to the Sites, Services or its content; third party Internet sites, programs or conduct; viruses or other disabling features; incompatibility between the Services and other services, software, or hardware; and any delay or failure in initiating, conducting, or completing any transmission or transaction in connection with the Services in an accurate or timely manner. These limitations also apply even if this remedy does not fully compensate you for any losses, or fails its essential purpose; or even if brettapproved knew or should have known about the possibility of the damages. Changes to Services. brettapproved may change the Services from time to time, with or without notice, by adding, modifying, suspending, or discontinuing features of the Services. brettapproved reserves the right to cancel, suspend, or block your access to the Sites or Services at its sole discretion for violations of these terms, the brettapproved community communications etiquette, or for any other reason and without notice (subject to any contractual rights you have with specific Services), and access to any Services is dependent upon you complying with any applicable laws. Notices. If brettapproved must send you additional information regarding the Sites or Services, or in connection with this Agreement, you consent to receiving this information electronically. brettapproved may provide required information to you by email at any address you registered with the Sites or Services or via the Sites or Services itself. Notices provided to you via email will be deemed given and received on the transmission date. You understand and agree that this Agreement and any notices given pursuant to this Agreement are enforceable in electronic format. brettapproved is not obligated to notify you if changes are made to this Agreement, so please check the terms regularly. Forum and Jurisdiction. This Agreement is governed by the laws of the State of Arizona, U.S.A., without regard to its conflict of law provisions. All disputes related to or arising from this Agreement will be subject to the exclusive jurisdiction and venue of the state and federal courts located in Phoenix, Arizona; to which jurisdiction and venue you and brettapproved each irrevocably consent. Additional Rights and Obligations. If any provision of this TOU is held to be invalid or unenforceable, such provision shall be deemed superseded by a valid, enforceable provision that most closely matches the intent of the original provision; the remaining provisions will remain in full force and effect. Any party’s failure to act with respect to a breach of this Agreement does not constitute a waiver or affect that party’s rights to act subsequently. Users may not assign rights or delegate any duties under this Agreement. brettapproved may assign rights or delegate duties under this TOU in connection with a merger, reorganization, or sale of substantially all of its assets. This TOU will bind successors and permitted assigns. Want to contact us about this agreement? Send us an email to [email protected].